Everybody needs love, and the Starlight Kiss online pokie gives our Aussie gamblers so much of it! Available in free play and real money, this pokie appeals to the romantic gambler. In fact, it is a fascinating and passionate alternative to the numerous action-packed-adrenaline-pumping pokies. Brought to you by hotshot casino games software provider – Microgaming; which delivers the very best in entertainment, always. The game forms part of Microgaming’s ‘romance-themed pokies’. Other romance-themed pokie titles include Immortal Romance, Secret Romance and The Finer Reels. Read on to learn more about how you can let love prosper while you win big bucks on this real money pokie. Like all online casino games from Microgaming, the pokie boasts top-notch graphics and superior sound quality. The combination results in a fabulous online gaming experience. You can look forward to game symbols related to romance. The Starlight Kiss logo is the wild, scatters include the bonus kiss and the mansion. Coincidentally, the wild and the scatters are the games highest paying symbols. The scatter launches the games’ free spins feature. Other symbols include the lovers, a box of chocolates and a love letter. Aussie gamblers have the opportunity to trigger the free spins feature whenever three or more scatter symbols appear on the reels. The free spins bonus includes 14 free spins. The romance bonus is activated by the romantic bonus symbol landing on reels two, three and four. By filling the bonus meter, you can increase your bonus wins. You fill the bonus meter by selecting three out of ten objects that either award you hearts or coins. To sum it up, Starlight Kiss is tender online pokie with charming, winning potential. We recommend our Aussie readers join two lovers on a reeling romantic adventure! 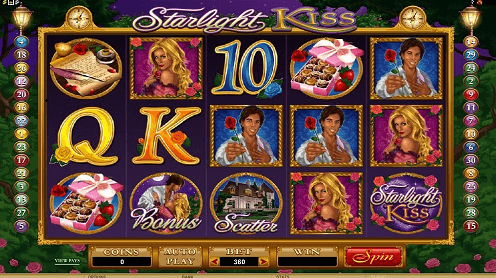 Play Starlight Kiss at an Australian online casino found here on Pokies.com.